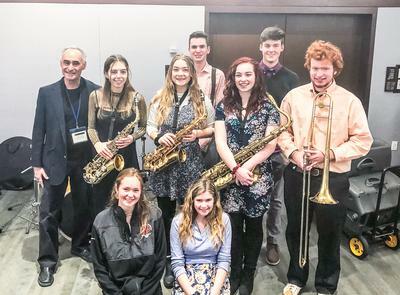 “It’s an exhilarating moment as a music educator anytime you can play with some of the best high school ensembles in the country and do better than all but one or two of them,” said George Stevens Academy’s Steve Orlofsky of the performance of Jam Bake at the Berklee High School Jazz Festival in Boston on Saturday, January 26, in a news release. The combo, directed by Orlofsky, took third place in the festival. More than 200 high school ensembles participated. Jam Bake is composed of Courtney Bianco ’19, alto sax; Edward Conte ’19, drums; Erika Hipsky ’20, alto sax and flute; Duncan Howell ’20, trombone; Quinn Stabler ’20, bass; LeeAnn Varnum ’19, soprano and tenor sax; Elana Williamson, ’19 vibes and piano; and Tess Williamson ’19, piano and vocals. This is the sixth time a GSA jazz combo has risen to the challenge and placed in the top four at the festival, which they did in 2004, 2005, 2010, 2011 and 2017.